When her acting career ended she became a painter and sculptor. She was also one of the 500 stars nominated to become one of the greatest American screen legends as part of the AFI’s 100 Years—100 Stars event in ‘99. The gifted 5' 9" actress who we so well remember in westerns as a female bandit leader, dance hall Madam or “the other woman” was born Emily Marie Bertelsen Dec. 11, 1919, in the farming community of Marysvale, UT (population 300), to Etta and Lane Bertelsen. Acting was always her primary goal even before her two years at Brigham Young University where she appeared in various plays. Crowned Miss Utah, the title enabled her to enter and win the “Gateway to Hollywood” Jesse Lasky Radio Talent Show in Salt Lake City. This led to being accepted as a student by Maria Ouspenskaya, radio work and small roles in some 30 films from ‘41-‘48, often at MGM. 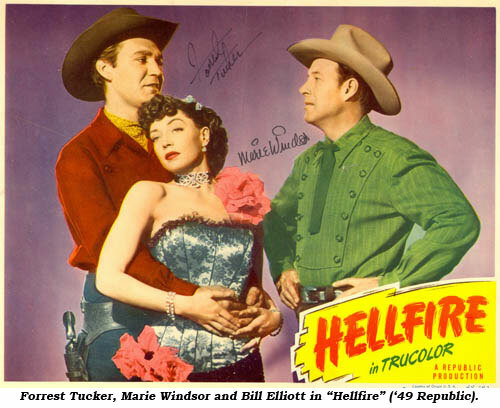 But it was Republic’s superb and offbeat “Hellfire” in ‘49 that made Marie a star. “Bill Elliott saw the test I’d made and when he learned I was a horsewoman, he fought with the studio to use me instead of one of their contract players, Adrian Booth. I felt badly, because by rights, the part should have been hers. So I sent her a dozen roses. Bill taught me how to twirl a gun and holster it quickly. I did a lot of the stunt work in ‘Hellfire’ that normally an actress simply wouldn’t do.” Marie described her role of Doll Brown as “rich and rangy.” Doll was a young woman who’d suffered betrayal, who’d lost all caring about anyone except her still innocent younger sister. To pay her way while trying to locate her sister, Doll turned outlaw and traitor to the rugged but gentle prairie preacher (Elliott) who tried to help her. Finally realizing the enormity of her transgressions, in an ironic turn of events, she nearly killed the man (Marshal Forrest Tucker) whom her sister had married. In the end, she heeds the Sky Pilot’s words and repents, turning to God for help. Marie’s understanding of her misguided hellion—the anger and the ultimate warmth—revealed all the facets of Doll Brown’s character and assured the actress of a solid career. 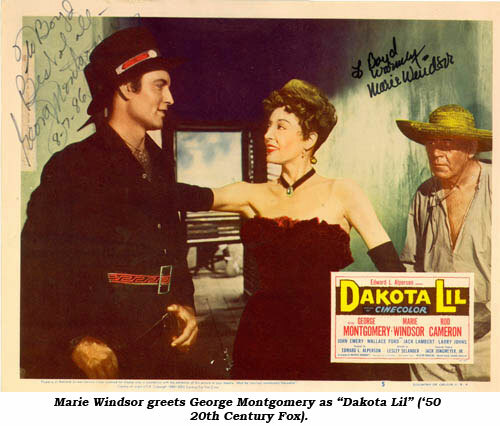 Unfortunately, Doll Brown often typecast Marie as a bandit queen or saloon Madam, as in her next role, “Dakota Lil” (‘50), a glamorous cabaret singer whose lucrative sideline was counterfeiting. 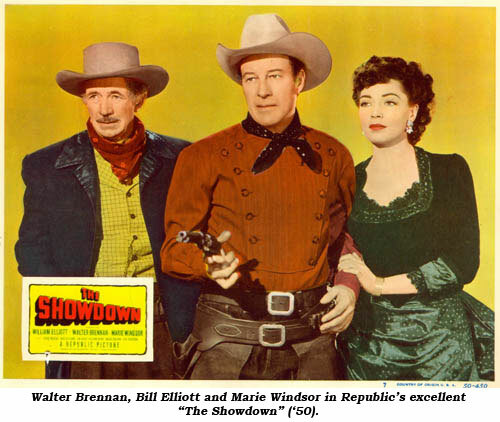 With Bill Elliott again in “The Showdown” (‘50) Marie proved to be a sympathetic saloon keeper/adventuress. “Little Big Horn” (‘51) gave her the small but pivotal role of a lonely, bored Cavalry wife of Capt. Lloyd Bridges secretly cavorting with Lt. John Ireland. For “The Tall Texan” (‘53) she was among a greedy group of gold seekers. “The Silver Star” (‘55) gave her a more sympathetic role, that of Earle Lyons’ loyal sweetheart. Don’t bother with “The Parson and the Outlaw” (‘57) where Marie is gunman Bob Steele’s concubine sporting the worst Mexican accent this side of Tim McCoy. 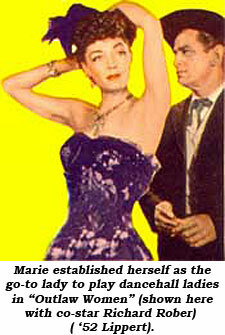 Marie was the girlfriend of outlaw Christopher Dark in “Day of the Badman” (‘58). Time after time Marie was saddled playing assorted saloon Madams: “Two Gun Lady” (‘55), “Mail Order Bride” (‘64), “Good Guys and the Bad Guys” (‘69), “One More Train to Rob” (‘71). Fortunately, Marie closed out her big screen Westerns as a “good woman”, a frontier widow in love with John Wayne in “Cahill, U. S Marshal” (‘73). 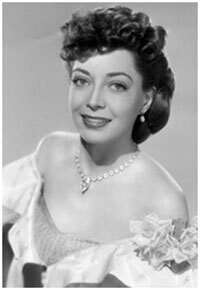 Marie began her notorious small screen career with the well-remembered role of the flume-plumed hat-wearing “Belle Starr” on “Stories of the Century” in ‘54. 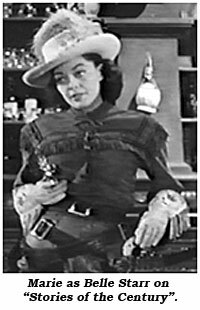 Then, it seemed if a TV western needed a saloon owner/madam/dance hall queen, they called on Marie, such as “Cheyenne: Decision at Gunsight”, “Bat Masterson: The Fighter”, “Rawhide: Incident of the Painted Lady”, “Wyatt Earp: Wyatt Earp’s Baby”, “Bronco: Equalizer”, “Maverick: Epitaph for a Gambler” and “Quick and the Dead”, “Destry: Nicest Girl in Gomorrah”, “Legend of Jesse James: The Quest” and “Hec Ramsey: Green Feather Mystery”. 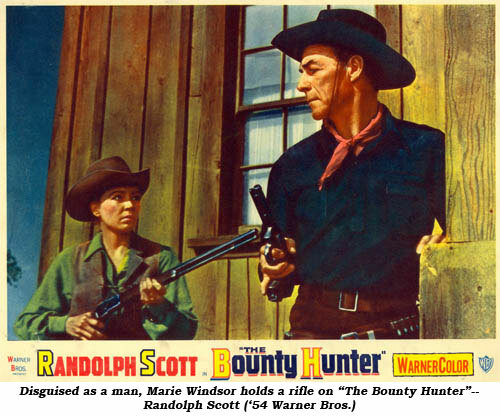 She was just plain rotten in “Bonanza: Five Sundowns to Sunup” as the mother of an outlaw brood; “Rawhide: Edge of Madness” as a traitorous Southern Belle; “Californians: Regulators” as a lady kidnapper and “Whispering Smith: Trademark” as a revenge bent widow. Every now and then she was cast as a rancher’s wife or kidnapped lady, and she got to shine on the right side of the law in “Cheyenne: Mutton Puncher” as a tough-as-nails lady sheepherder; in “Rawhide: Incident of the Rusty Shotgun” as a sympathetic spinster hoping to marry Wishbone (Paul Brinegar) and in “Yancy Derringer: Ticket to Natchez” at first believed bad, turning out to be a government special agent. In 1983 Marie was awarded a star on the Hollywood Walk of Fame. Sidelined by crippling arthritis and several operations beginning in 1996, the Western world lost our favorite dance hall queen December 10, 2000, shortly before her 81st birthday.